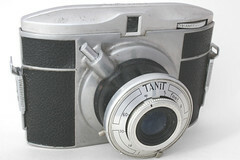 The Tanit is a small cast metal camera taking 3x4cm exposures on 127 film. 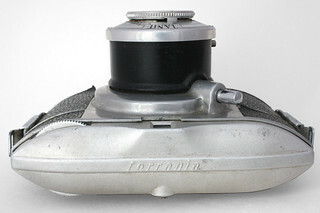 It was made in Italy by Ferrania, c.1955. The name may come from a Phoenician goddess of war and fertility. The Tanit has a simple I/B everset shutter with flash synchronisation via a PC socket. This houses a focusing lens with no focal-length or aperture markings. Strap lugs at either end slide downwards to release the back. The back has two red windows to accommodate the 127 half-frame format. The viewfinder has a portrait format rectangular window window above the lens, but a square eyepiece on the back, which is minuscule - not much over 3mm across. Examples have been seen with black leatherette covering, as here, or dark red. ↑ McKeown, James M. and Joan C. McKeown's Price Guide to Antique and Classic Cameras, 12th Edition, 2005-2006. USA, Centennial Photo Service, 2004. ISBN 0-931838-40-1 (hardcover). ISBN 0-931838-41-X (softcover). Page 292. ↑ Tanit with red leatherette sold as Ebay item 191963343200, September 2016. This page was last edited on 5 September 2016, at 23:04.